Calgary’s economy is headed for a glass half full — or half empty — type of year, depending on how you view the world. For those staring up at the grey clouds, some negative signs loom overhead: growth in the local economy will slow down substantially to 2.5 per cent this year, according to a Conference Board of Canada report released Tuesday. That’s far off last year’s scorching pace, when Calgary led the country with 6.9 per cent economic expansion, although the big jump came in the aftermath of a punishing two-year recessionary fall. Housing starts and the downtown office market will remain in a funk this year, and the unemployment rate is expected to stay above the national average for the next five years. For optimists, however, more bright spots are appearing. 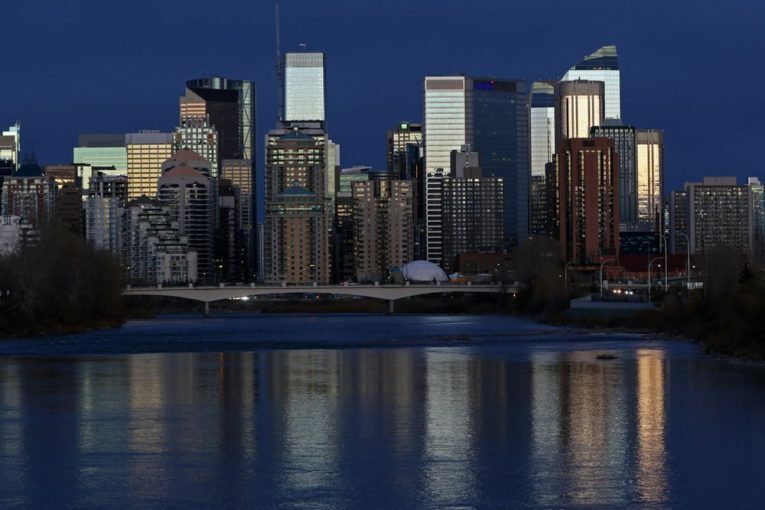 Beginning in 2019, Calgary’s economy will grow at roughly the same rate for the following four years — averaging 2.4 per cent annually — which will be tops in the country. “It’s way weaker than what you are used to, but still better than anywhere else,” said Alan Arcand, associate director in the centre for municipal studies at the economic think tank. Much of Calgary’s economic optimism is still fuelled by the unpredictable fortunes of energy prices. With the plunge in oil markets in 2015-16, the city’s economy suffered its first back-to-back contraction since the collapse of global oil prices back in the 1980s. Pink slips rained down inside downtown office towers and the city’s unemployment rate jumped above 10 per cent in late 2016. Calgary saw 12,400 jobs disappear that year. A rebound in oil prices and drilling activity in 2017 saw the sector begin to stabilize. Crude prices have traded above US$60 this year, bolstering consumer confidence and the outlook for business operators. “I meet a lot of different customers every day and I see the reaction from people — they are more inclined to spend money than they used to be,” said Greg Garcia, president of Calgary Elite Roofing, who expects sales to increase by about five per cent this year. The job market is also headed in the right direction, although not fast enough for everyone’s liking. Employment grew by 3.3 per cent — or 26,300 jobs — in Calgary last year and the unemployment situation should continue to improve in 2018, Arcand said. A two per cent bump in employment this year, and moderate annual growth of one to two per cent in the following four years, should cut the jobless rate to 6.2 per cent by 2022, although that’s still above the city’s normal levels. The number of people leaving Calgary for other provinces should also slow down. After years of being a magnet for job seekers from across the country, Calgary saw an average of 1,600 residents relocate to other provinces during each of the past two years. “The worst appears to be over. Although net interprovincial outflows will continue over the next few years, they will be greatly diminished starting this year,” the report states. Bright spots for the local economy include higher oil prices, an expanding services sector, relatively strong retail sales (forecast to rise by 2.6 per cent this year) and moderate growth expected in the local construction sector. On the downside, the office vacancy rate in the city’s core ended last year at almost 28 per cent. It’s unlikely Calgary will see any new downtown office buildings constructed in the next decade. “We’ve always said that in spite of that significant growth in 2017, that we have long-term problems, which are 13 million square feet of (vacant) office space and we still have quite a few people unemployed,” said Mary Moran, CEO of Calgary Economic Development. On the housing front, home starts are expected to remain tepid in 2018, increasing slightly to around 11,500 — far off the peak of 17,130 units built four years ago. Arcand said another significant issue hanging over the market is the number of new unsold housing units in the city. According to data from Canada Mortgage and Housing Corp., the city had 1,208 unabsorbed apartments in Calgary, roughly 20 per cent of all unsold apartments in the country. So the outlook for 2018 is a varied one, with the local economy continuing to grow moderately, and the initial burst of post-recession activity now behind us. Lagging investment in the oilpatch remains a problem. The need for new pipelines to improve oil and gas prices hasn’t been resolved. But more people are finding work, consumers are more confident and business is picking up in certain quarters. There’s something here for both optimists and pessimists alike. “Things are coming back and people are adjusting to what we call the new reality,” said Phil Roberts, CEO of Vintri Technologies and chair of the Calgary Chamber of Commerce.